So today has been spent on the computer working out different layouts for the spaces surrounding the central ring. After spending ages surfing last night I had decided the way to go was a variation of split four patch for both the areas surrounding the central circle and the outer border. I even took out pen and graph paper last night and made a preliminary sketch which looked great! Don't you just love my understated opinion! I would show how great it was but it was just too good to keep and I was glad I only wasted my time and not my fabric as well. 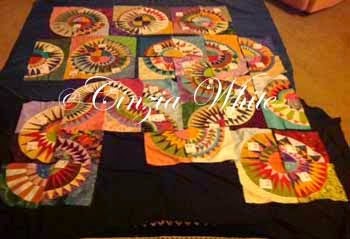 My next idea was to extend the rings that form the inner circle and develop within these more spokes similar to those that I liked throughout the quilt. I hoped to carry the idea of a ring by using the same colours in all four segments, even though the ring was broken by overlapping blocks in places. 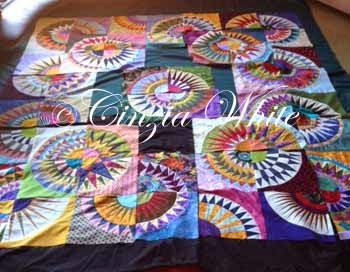 Worked it out and was very happy with it until I printed it out and went to lie it in place on the quilt. Slight problem... I had miscalculated the size of the spaces...... back to the drawing board. This time the task was a lot quicker and I now have worked out a design which at least fits the spaces. Yes I realise the above plan looks more balanced but... and this is a big but.... it doesn't fit in the space. 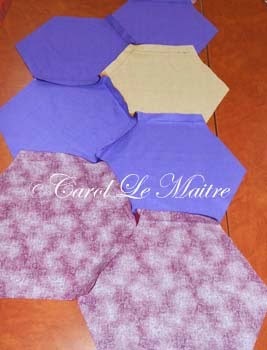 I have tried out a few fabrics and think these will look good. So tomorrow's task is to cut the fabrics and if I'm lucky sew the missing blocks also. If it looks good I might even make a spiked border. I have been tossing up,the idea for a while now. Sometimes think it will look great other times feel it might be over the top....we will see. When Carol showed it to her children and said they would have to fight for who received it when she passes on, her daughter replied that they would bury her in it as she had enjoyed making it so much. Carol's horrified look and threat to haunt them forever if that eventuated means that they will now flip a coin for it. 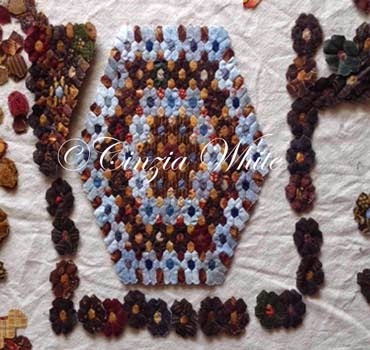 It is amazing how our children sometimes don't see that we wish for them to keep the things we lovingly made rather than gift them to us for the afterlife like in ancient Egyptian times. Well I definitely wasn't happy with either of those two layouts, and I was even less happy with the unpicking. Thankfully it was only the hand stitching as frog stitching is a real pain with the shorter stitch length I prefer these days. As I now press my seams open where possible I have shortened my stitch length to add strength to the seam. Why am I now pressing seams open? 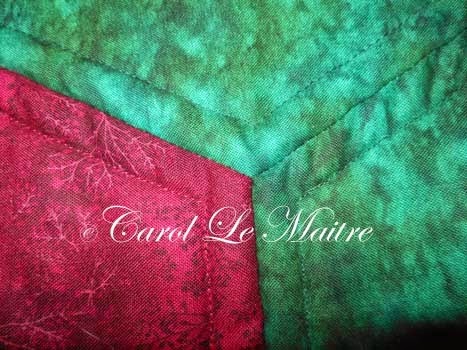 Well it gives less bulky spots when machine quilting and while my machine quilting leaves a lot to be desired....one day it will be to dream for. Hey I dream about that now! So after unpicking a number of seams I have worked out a third layout and it's looking OK. I still need to work out what to do in those spaces around the central block but that is tomorrow's problem. 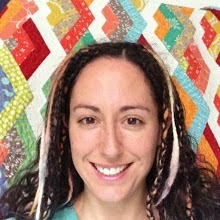 Well as you can see the wedding quilt is chugging along beautifully....says she with a totally biased viewpoint. I have now finished 55 of the needed 56 blocks. Will get onto the last one ...... soon. 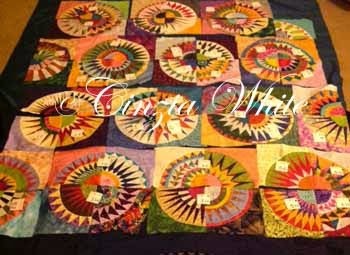 My first plan was to make the quilt 6 x 8 and have a semicircle extending into the border on each side. However when I sat down and checked over my calculations it seemed as though this would leave the quilt just that little bit too narrow. Ok no problems I thought. 6 x 8 + 8 is the same as 7 x 8. See you can tell I was once a maths teacher... no need for that look! Anyway the ahh ha moment was soon an mmmmm? moment when I discovered that New York Beauties don't work that well in odd numbered settings. Actually it was a very long soon. You see I'm the kind of person who jumps in and sews things together as soon as an idea comes into my head and then I work out the finer steps. So on a quick trial and error, taking only about an hour I decided I would make 12 circles and then use the leftover blocks to fill in the gaps. Two days later I have HAND stitched all of the blocks into pairs and have laid them out to check that they still look good. As you can see they don't look good at all. Phooey...will have to look into it further tomorrow! So after two weeks of ditch stitching with my FMQ foot I can honestly say that Helen was right. With practise I am improving. When I concentrate and watch just what I will be quilting next, rather than later in the project, I find that I can be rather accurate. I was using my BSR initially but found that it seemed to stick and so I resorted to the old darning foot and although my stitch length needs working on I am improving on stitching in the ditch. I even managed to keep up the practise for ten days out of the fortnight so that is also pleasing. The tools that I found most helpful were the extension table, but this goes without saying as it is impossible to manoeuvre a huge quilt without having some space to work on. Also extensively used was the supreme slider. 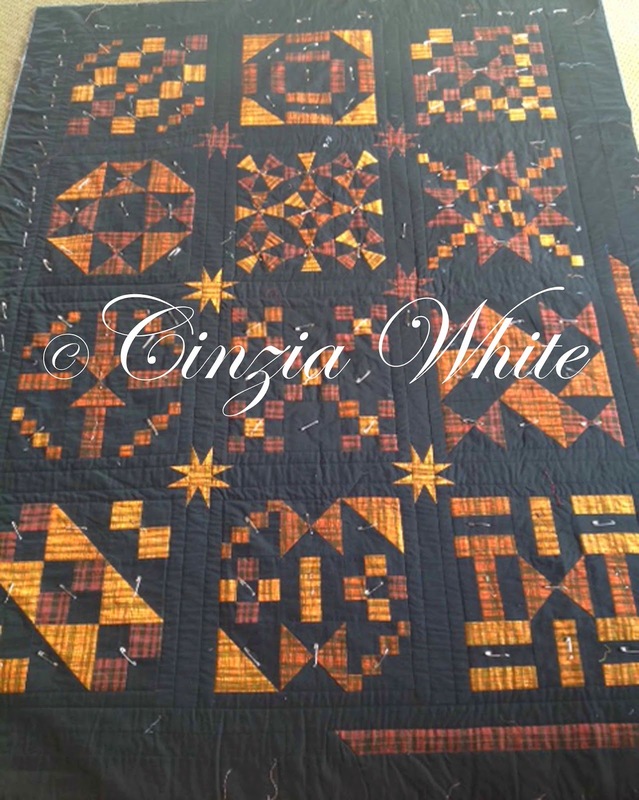 This is like a large Teflon type sheet that sticks to your extension table and then allows the quilt to be moved with less tension than usual. You can check it out here. If you decide to get one check out Judy's site everyday as January is her birthday month and she has a different special each day. In previous years she has offered a choose anything in the store and receive a discount. Discounts vary, depending on the product and the special she has going that day. Another tool that I found very helpful are the Grip and Stitch quilting disks. These are also available on Judy's site here. They work similarly to the gloves with the rubber finger tips, except they are easier as when you want to use your bare hands you simply let go of them. My target for the rest of the month is more of the same. 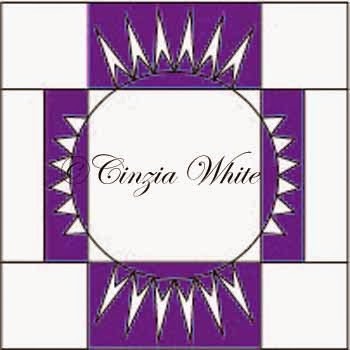 I have several quilts that I can practise on and as I expect to be starting to quilt the wedding quilt sometime in February I have room for further improvement before that day. Now off to see how others are going. 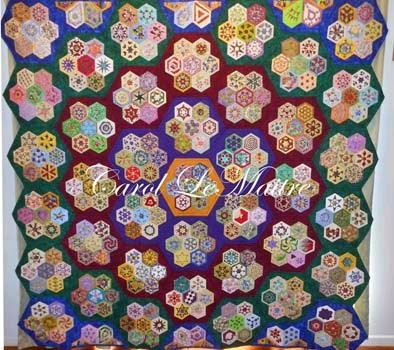 Oh for those interested here is a photo of the back of Carol's Quilt.... all lovely and tidy isn't it? 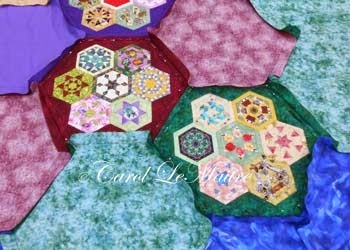 Well I don't think my photoshopping has shown this too clearly but here you have Carol's quilt in progress. Her method is different from mine and I thought people may like to see her way of doing things. 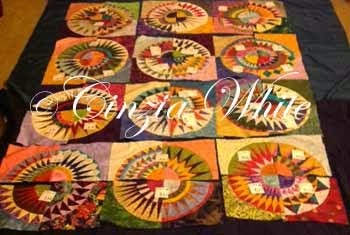 After completing the collections she quilted them with only the top and the wadding, no backing fabric. 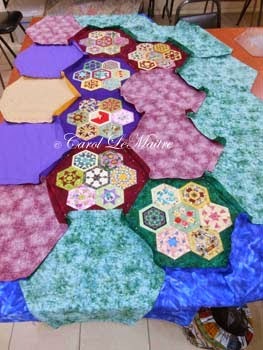 Next she machine stitched her quilt backs together in two sections using the same colours as she'd used for the collection frames. Above left is the beginning of the joining process and to the right you can see half of the quilt. There is another section similar to the below one but without the middle row. 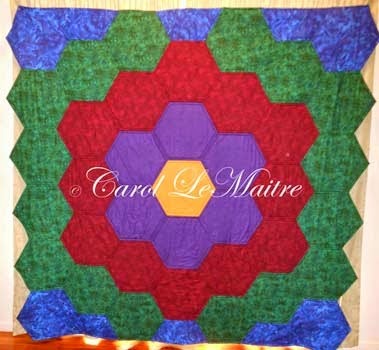 The back hexagons are cut 1 1/8in larger than the quilted collections. 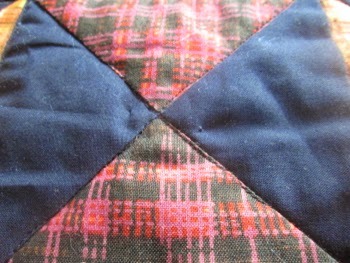 The backs are then joined using 1in seam allowances. If you look closely at the photo below you can see the large seam allowances. The quilted collections are next placed into the backs with the frames being the same colour as the backing and the extra backing fabric is folded over onto the front covering the outer edges of the collection. A small hem is folded and the extra backing fabric is folded over to meet where the outer border of the collection is joined to the collection centre. 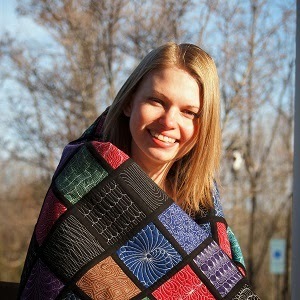 I made the picture larger so hopefully you can see her pins holding the backing in place on the front. Using the same colour backing as the frame means it is impossible to tell that you are looking at the back fabric framing all of the collections. Quite a clever bunny isn't she! Well today is one day that I can fulfill all of the required steps for the FMQE.... listing my target for the next two/four weeks. Hopefully I can manage a fortnightly post. After reading all of the hints that were given through the QDU forum I have decided that I can manage ten minutes a day. I will set my target at seven days a week but will be happy with five. 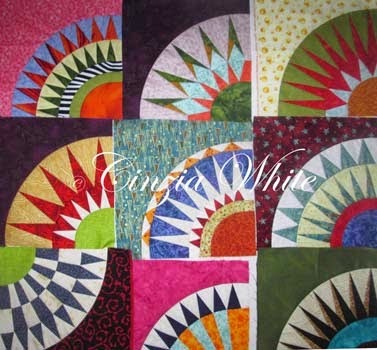 I started this quilt a few years ago and will work on it. As I am in the process of making a wedding quilt for PJ and Khanam which will need a lot of ditch stitching I am going to practise free motion ditch stitching for these two weeks. 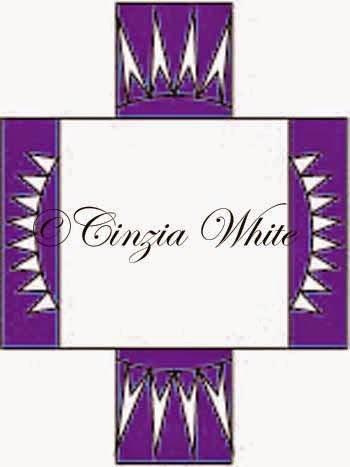 Anyone else want to join up simply click the click to enter button on the right to add your blog addy.